Why? Because tests are called too early and/or sample sizes are too small. You should not call tests before you’ve reached 95% or higher. 95% means that there’s only a 5% chance that the results are a complete fluke. A/B split testing tools like Optimizely or VWO both tend to call tests too early: their minimum sample sizes are way too small. Here’s what Optimizely tells you: A sample size of 100 visitors per variation is not enough. Optimizley leads many people to call tests early and doesn’t have a setting where you may change the minimum sample size needed before declaring a winner. However since the sample size here was too small (only a little over 100 visits per variation) I persisted and this is what it looked like 10 days later: That’s right, the variation that had 0% chance of beating control was now winning with 95% confidence. You NEED TO calculate the actual needed sample size ahead of time, using sample size calculators like this or other similar ones. This is a pretty useful tool for understanding the relation between uplift percentages and needed sample sizes: http://www.testsignificance.com. So if you don’t test a full week at a time, you’re again skewing your results. Run a conversions per day of the week report on your site, see how much fluctuation there is. Here’s an example: What do you see here? Thursdays make 2x more money than Saturdays and Sundays, and the conversion rate on Thursdays is almost 2x better than on a Saturday. 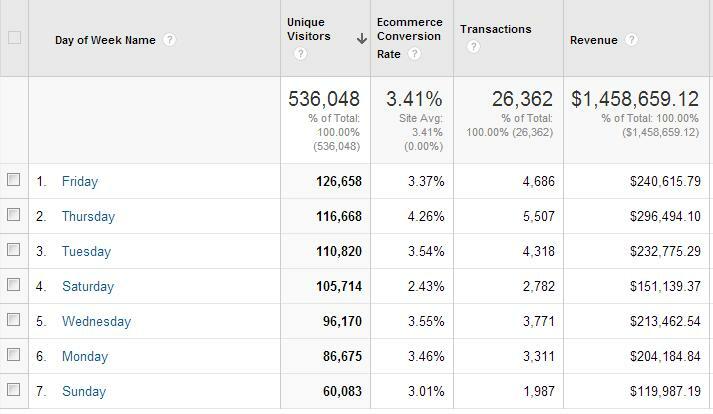 While Optimizely has some built-in segmentation of results, it’s still no match to what you can do within Google Analytics. You need to send your test data to Google Analytics and segment it. If you use Visual Website Optimizer, they have a nice global setting for tests, so the integration is automatically turned on for each test you run. 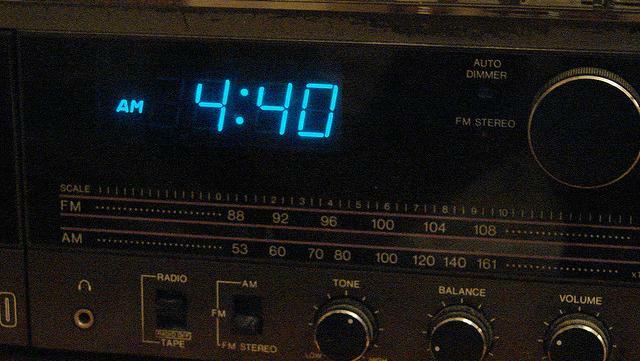 Set it and forget it: Optimizely makes you suffer for whatever stupid reason. They make you switch on the integration for each test separately. They should know that people are not robots and sometimes forget. Guys, please make a global setting for it. 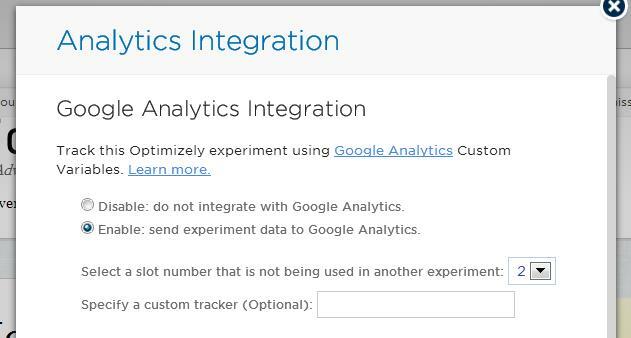 So what happens here is that they send the test info into Google Analytics as custom variables. You can run advanced segments and custom reports on it. It’s super useful, and it’s how you can actually learn from A/B tests (including losing and no-difference tests). But Monetate – which should be a class above the other two services, since it costs way more, is not even able to send custom reports. Ridiculous, I know. They can only send test data as events. So in order to get more useful data, create advanced segments for each variation and create a new segment based on the event label: And you can check whatever metrics in GA with a segment for each variation applied: Bottom line: always send your test data to Google Analytics. And segment the crap out of the results.